You don't get to be captain without having style and swagger. You also need a ship, but we're pretty sure it's mostly the swagger. 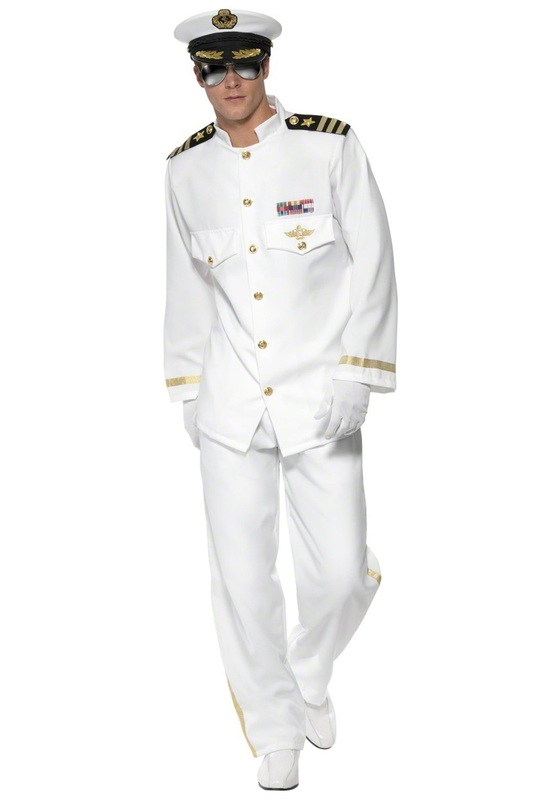 Now you can enjoy shore leave in style in this Deluxe Captain Costume, without ever setting foot on boat! We don't have a ton of experience at the helm of a mighty vessel (unless you count inflatable pool rafts, which we are seasoned pros at commanding), but we bet it's harder than just giving orders while your crew does all the work. There's a lot of pressure to make the right decisions, which usually have to be made in split seconds, and the fate of the whole crew may be hanging in the balance. One wrong move or hesitation at the wrong time could mean a watery grave for your ship and everyone on board! The real challenge, though, is keeping stuff from spilling on your fancy uniform, because everyone is going to notice it right away, and that would be really embarrassing for a captain. Spilling stuff on this pristine white costume probably isn't a good idea, either, but since you not a real naval commander, you won't be court marshaled if you do. In fact, sporting this suave costume lets you experience all the cool parts of being a nautical captain, like wearing a slick looking sailor cap and having epaulets and shiny buttons and ribbons on your jacket, but without the stress of being in charge of a multi-million dollar boat. Just add a pair of white dress shoes, and then your party can really set sail!